Madame Tussauds Sydney has revealed the global sensation and much anticipated One Direction wax figures down under. The boy band has been top of the list for Madame Tussauds Sydney's most requested since opening in 2012 and now, the devoted Directioner's prayers have been answered. Die-hard fans dressed in One Direction memorabilia, eagerly lined up to be among the first to see the life-like figures of Harry Styles, Zayn Malik, Liam Payne, Louis Tomlinson and Niall Horan at Madame Tussauds Sydney. Among the mass excitement, it was Chloe Boyling, a dedicated fan who started the long line, arriving at 6am in the morning! Chloe was lucky enough to attend the One Direction concert last night in Sydney but it was only this morning that she had the chance to see the One Direction band up-close, in all their glory. As the attraction opened, fans flooded the entrance to get the once-in-a-lifetime chance to get up close to the boys, with no ropes. Harry: 'This is weird!! Thank you so much, it's amazing and such an honour." Liam: 'This is absolutely nuts - mine can stand in for me 100% - it's like I'm stood here!! He's got my tattoos, my birthmark. Imagine looking at another you, smirking back at you. This is definitely a privilege, getting a wax figure - my mum loves it. Good job to the team." Niall: 'It's really good, isn't it?! This is WEIRD. He's wearing my actual shoes! Sick. How amazing are Madame Tussauds?!" Louis: 'Just wow. Zayn looks crazy good! This is weird. I can't wait for the fans to see them." Zayn: 'It's weird; he's even got my tattoos! They look wicked, they're bang on. Niall's is scary, it's like I'm looking at actual Niall! I just hope the fans like them." The figures are styled in their signature smart-casual, colour-coordinated stage fashions, with outfits donated by the band members themselves. 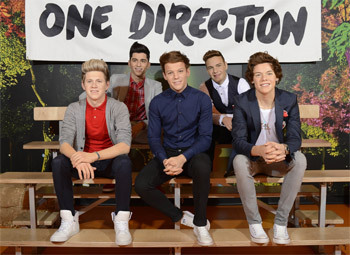 Madame Tussauds worked in close collaboration with the boys ensuring the wax figures are as lifelike as possible with each member participating in two sittings for the measurements, poses and styling. Located in the Music Zone of Madame Tussauds Sydney, the One Direction wax figures will be on show until January, 28th where they continue their tour to Tokyo. 'This is a great moment for us. The One Direction wax figures have been a requested favourite since the opening so we are very excited to finally see them take pride of place at Madame Tussauds Sydney. With the overwhelming response received today, we anticipate the figures to be among the most popular at the attraction," commented Quinn Clarke, General Manager, Madame Tussauds Sydney. Propelled to international success by their great musical talent and the power of their devoted fans, One Direction has truly made their mark on the international music scene. The figures have joined the ranks of over 70 wax figures at Madame Tussauds Sydney and visitors now have the extraordinary opportunity to strike a pose and have pictures taken alongside the much loved One Direction group.